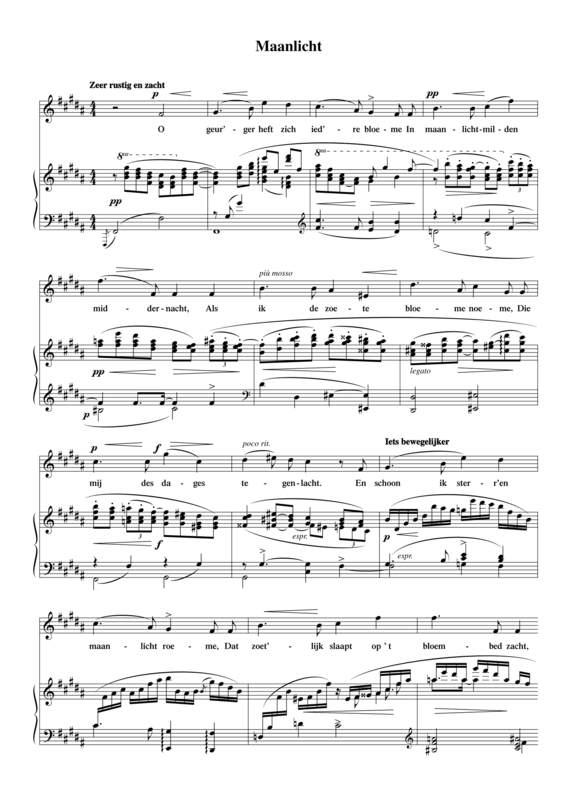 The sonnet form of Maanlicht is reflected in the composition: Diepenbrock uses the opening melody of the voice for the beginning of the second strophe too (see mm. 10-13). However, the piano goes from a melodic quaver movement to a more figurative semiquaver movement. In the third strophe the vocal part has predominantly consecutive seconds, with the exception of the descending octave leap f#2-f#1 on the word “herinnering” (recollection) which thus refers to “middernacht” (midnight, m. 5) and “bloembed” (flower bed, m. 13). After a four-measure interlude, the two final lines are set to a variant of the opening melody, making this one of the few songs that has a circular form. Particularly remarkable are the descending minor seconds on the word “mijmering” (reverie), which may well be a reference to the love motive in Wagner’s Tristan and Isolde. Like Meinacht (May Night, RC 14), Maanlicht was never performed in public during Diepenbrock’s lifetime. The work was not published until 1951. It has not been documented why Meinacht was not included in A.A. Noske’s series of songs of 1905, which contained four settings of Dutch sonnets. A consideration may have been that in De Nieuwe Gids of December 1885 Willem Kloos spoke quite unfavourably of this poem and that Verwey himself did not select Maanlicht for his Verzamelde Gedichten (Collected Poems, 1889, published by W. Versluys in Amsterdam) either. Die mij des dages tegenlacht.